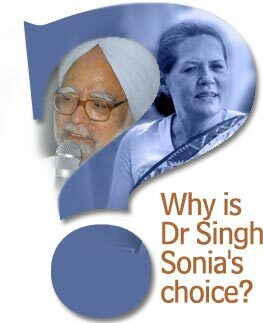 Rediff.com » News » Why is Dr Singh Sonia's choice? Why is Dr Singh Sonia's choice? For god's sake, who would refuse to be prime minister? Which Indian politician would reject the chance to savour all that intoxicating power? Congressmen are in a state of shock. They can't believe that Sonia Gandhi has done the unthinkable. Across the capital, BJP leaders no doubt cluster in uncertain silence. By abandoning the post they were so certain she would grab with gusto -- after all, she is ITALIAN! wink, wink -- Sonia Gandhi has left the BJP leadership, already tottering under an electoral debacle they did not ever expect, like the proverbial duck frozen in the headlights of a container truck. I am not surprised by Sonia's decision at all. I have always argued that she would never be prime minister. Even after she won an improbable mandate for her party last Thursday -- I agree it is a fractured verdict, but let us not dispute that the Vajpayee government was defeated -- I could sense that Sonia was reaching end game in this phase of her political career. Will you, now that you are leader of the Congress Parliamentary Party, be prime minister, one journalist asked last Saturday after her election by the CPP? "Normally aisa hi hota hain," she responded. She had opened a window to turn down the post. Sonia has always been a reluctant leader, all too familiar with her many political inadequacies. ►To protect her family's interests, which she probably felt were under siege from P V Narasimha Rao. A lot has been alleged about what Rao did to scuttle the careers of anyone he considered a rival -- from L K Advani to Madhavrao Scindia. During the Narasimha Rao years at Racecourse Road, people whispered about the manner in which the Widow was needled lest she emerge as an equal centre of power. ►To protect what she felt was her family's legacy, the Congress party. People like Mani Shankar Aiyar constantly warned her that Narasimha Rao and Sitaram Kesri were eroding the party's bastions across India by their calculated (in the first case; self above party), and thoughtless (in the second; for all his celebrated shrewdness as party treasurer, Kesri was a disaster as Congress president) political conduct. ►To protect her children's future. One of her adversaries, a future BJP chief minister who we shall not name, told one of our colleagues some years ago about how much she admired the way Sonia had brought up her children. I am not sure if either Rahul or Priyanka were clear that a political career was an option for them when their mother decided to lead the Congress in 1998. And who could blame them after seeing their beloved grandmother (Indira Gandhi cut short her trip to Orissa on October 30, 1984, the evening before she was killed, after learning that Rahul and Priyanka were involved in an accident; the first Mrs G feared her grandchildren may have been the target of an assassination plot) and their adored father murdered? When Sonia entered politics, I believe Reason 2 weighed more than Reason 1 and certainly much higher than Reason 3. Sonia probably felt or was led to believe by her advisers and diehard supporters that she could easily use the Nehru name to restore the Congress to its original glory. The operative word may have been easy to lure the painfully shy housewife into thinking that all she needed was to make an appearance for the party to laugh all the way to the ballot bank. As Rasheed Kidwai's lively biography Sonia (Penguin, 2004, Rs 399) reveals, the initial years in politics were agonising and humiliating -- I doubt if it is any better for her now, though last Thursday's results may have made all the pain worthwhile. Somewhere during all the encounters with the worldly and wise to bone up on her knowledge of issues and politics (don't snigger; this has nothing to do with being born Italian; this is a woman who gave politics the widest berth she could find, and 'fought like a tigress' when her husband decided to enter public life after his brother's death), Sonia probably made up a to-do list -- win as many state assembly elections as possible, and then somewhere down the line, win back power at the Centre for the Congress party. If ever the latter happened, I believe she knew she would not take the prime minister's job. She probably sensed that everything she had worked so hard for would rapidly come undone because of her genesis in that small Italian town whose name I can't spell or pronounce. I think she made up her mind early on itself that if ever the Congress party won power in New Delhi, she would hand the prime minister's job over to someone she trusted implicitly until -- and somewhere down the line Reason 3 and Reason 2 merged into one -- her children were in a position to inherit the mantle. Don't miss the irony here! A leader pilloried for her foreign origin acting like the quintessential Indian mother. If she knew she would not be prime minister, you ask, why didn't she say so openly? Had she been frank about her intentions she could not only have stopped someone like Sharad Pawar from leaving the Congress party, but also ended the BJP's ugly campaign against her. Had she declared that she was not interested in power she ran the risk of eroding her presence in politics. She could easily have been seen as one of those numerous socialites who orbit the corridors of power, albeit with a famous surname. The army of sceptics who constantly interrupted her march within the party and outside, as Rasheed Kidwai tells us in his recommended biography, would never have taken her seriously had she then revealed her current intentions, making her irrelevant in Congress and Indian politics. If she wanted to be taken seriously, she knew she had to convey to politicians and public alike that she was in it for the long haul, for power itself. Sonia's march to recapturing Delhi for the Congress party has taken less time than one expected. All it has taken her are two general elections. The 1998 election was fought under Sitaram Kesri's presidency; she was just its star campaigner, and a hesitant one. The 1999 election came just 20 months later, and we believe the new Congress president was just as unprepared as in 1998, even though her party stunningly won power in Delhi and Rajasthan and recaptured Madhya Pradesh against all odds in November 1998. Sonia worked hard, but there was just too much goodwill for Vajpayee and his NDA. Little wonder that the Congress plunged to the lower depths that election -- 114 seats in the Lok Sabha, its worst performance ever. When power came last week, Sonia knew the time had come for her to end all ambiguity -- remember, not once had she clearly said she wanted to be prime minister. Making it easy was the fact that her son had won his first Lok Sabha election, and her daughter was the ace waiting to be played next time. knew better than most in her party that had she accepted the prime minister's office, she would have handed the political initiative over to the BJP and its brothers on a platter. Through her term in office, nothing else would have counted barring the daily campaign against her mounted by the Sangh Parivar. All achievement would have been muffled in the cacophony. She has always known the risk. The possibility of her ascension to office had already alienated large segments of the population -- even those who disliked the BJP and deplored its politics. Had she actually taken office, these separate pockets of antagonism could have coalesced into a mass that may have threatened both her party's wellbeing and her children's political future in the next general election. That is really what May 18 is all about. The next general election to the Lok Sabha. If all goes well, and the allies don't do to the Congress government what it did to the United Front governments in 1997, the next general election will be held in 2009. Rahul will be 39, hopefully have served educative apprenticeships in the party and government, and ready to accept what the Congress party believes is his destiny. If the BJP's campaign -- and no one should doubt that Rahul will be next in the party's sights; nothing unnerves its leaders (and ironically Mulayam Singh Yadav as well) as much as the thought that another generation of Nehrus could make them irrelevant -- renders Rahul ineffective, Sonia always has her ace. Her daughter, who on current form can alter the results in any constituency she campaigns in. Why is Dr Manmohan Singh Sonia's choice for prime minister? After all, this is a man who was closely associated with P V Narasimha Rao, who she apparently dislikes most in the Congress organisation. Why not Pranab Mukherjee, who Rasheed Kidwai tells us, played a key role in educating Sonia, illustrating the learning process with instances of how her mother-in-law tackled issues or the nation's problems? Or Arjun Singh, who is said to have spent long hours outside her office, despite his age and infirmity, to prove his loyalty to her? Both men have held high office, have a reputation for administrative ability and are certainly very ambitious. They are also politicians of a certain vintage unlike Dr Singh, who until Narasimha Rao plucked him out of bureaucratic obscurity, had spent all his life as part of the administrative establishment, largely unfamiliar with the murky world of Indian politics. Why then is Dr Singh Sonia's choice for prime minister? I believe -- and this has been apparent for a long time -- Sonia trusts Dr Singh more than anyone else in her party. She knows the advice he gives her comes without an agenda, without motive. His commitment to the Congress party and herself comes without strings or expectations of reward. Sonia greatly values his integrity and loyalty, and knows that he would willingly step aside if she ever asked him to, for her children or for anyone else of her choosing. There is a startling irony in her choice, though I doubt it is pre-meditated. By choosing Dr Singh to be prime minister, Sonia will probably bring to closure the deep trauma her mother-in-law inflicted on the Sikh community in the last year of her life, and in those horrific days after her death. What happens to Sonia now someone asked last night? Could this reluctant politician be marginalised in the party and by a new government? By what I call the Babasaheb Bhosle Syndrome? When Indira Gandhi asked A R Antulay to resign as Maharashtra's chief minister in 1982, she offered him the choice of successor. Antulay looked around and settled for Babasaheb Bhosle, a jolly and politically unthreatening MLA. Some months later, Antulay was livid that Chief Minister Bhosle had broken the shackles and was his own man, refusing to bow to the only Muslim who has been Maharashtra CM. Could that happen to Sonia? Could she be consigned to the political fringes? It is not the family name alone that provides insurance against marginalisation. Sonia came of age as a campaigner this election. She worked very hard and was the one factor, far above everything else, that brought the Congress its first look at power at the Centre in eight years. No Congressperson would be stupid to abandon the party's No 1 Campaigner. Anyone doubting that possibility needs to rewind the television footage capturing the yucky sycophantic scenes outside 10, Janpath these last two days (the more things change, alas, the more they remain the same). On the flip side, will she be like Bal Thackeray and use the remote control to keep Dr Singh and his ministers on a leash? Digvijay Singh told one of my colleagues last winter that Sonia Gandhi gives her party chief ministers a free hand. Though Diggy Raja didn't mention names, the comparisons with her mother-in-law who kept her chief ministers on edge virtually every day (Rajiv was more democratic, only slightly though) were obvious. I doubt if Sonia will be a constant thorn in Dr Singh's flesh. What will be really fascinating to watch in the months ahead is the role she develops for herself. Not since M K Gandhi has the Congress party had a leader who has spurned the highest office to play a role from outside government. She will, of course, never rival the Mahatma, but by making such a sacrifice (in the most glorious traditions of the dominant faith of her adopted country, I must add) Sonia Gandhi has clearly rewritten the rules of the political game and probably won over a constituency that used to despise her so much. G K Gokhale has followed the twists and turns of Indian politics for more than 30 years.